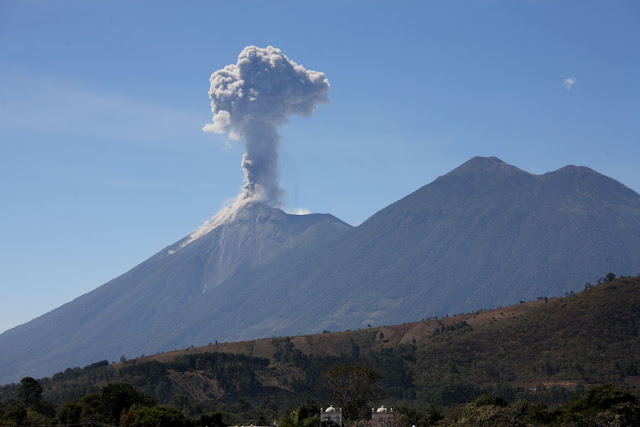 Guatemala's Volcano of Fire erupted today, spewing lava and sending up ash plumes that rained down ashes on nearby communities and could reach the capital, the civil protection authorities said. The Volcan de Fuego, one of the country's three active volcanoes, is located about 45 kilometres southwest of the capital Guatemala City. It was the volcano's second eruption this year. The rumbling 3,763-metre-high (12,345-feet) volcano was pumping out a series of moderate and strong explosions, according to the National Institute of Seismology, Volcanology, Meteorology and Hydrology. In addition to Fuego, the Central American country has two other active volcanoes: Santiaguito in the west and Pacaya in the south, just 30 kilometres from the capital.